WARNING: The wax contained in this jar will turn heads and create WHIPLASH! BLACKFIRE BlackICE Hybrid Montan Sealant Wax is a synthesis of German-sourced, color-charged montan wax and genuine Brazilian carnauba wax designed to bestow a dimension of gloss on black and dark colors that mimics the appearance of wet paint. Signature Wet Diamond Polymers provide exceptional resistance to UV rays and environmental contamination. Hybrid formula combines the benefits of synthetic and natural ingredients to provide the utmost in paint protection, gloss and clarity. BLACKFIRE BlackICE Hybrid Montan Sealant Wax, known internally as "project 23" due to the 23 months of research and development put into its formulation, started as an idea but quickly transformed into an obsession; a fascination by one individual who refused to accept contentedness in any project he became involved in. This perfectionist’s life-long infatuation with the ultimate car wax led to the birth of BLACKFIRE BlackICE Hybrid Montan Sealant Wax, a hybrid sealant wax tailored specifically for black and dark colored vehicles. 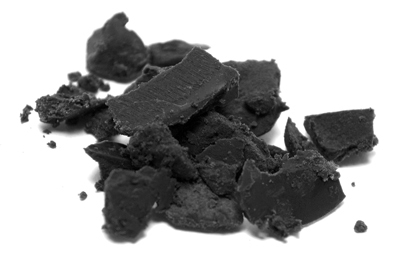 A core group of chemists at BLACKFIRE specialize in refining carnauba wax to its purest form, removing gloss-hindering impurities while making it exceptionally easy to work with; years of research and development spent on other BLACKFIRE car care products would not be wasted during the formulation of BlackICE. It was imperative early on in the development of BlackICE that it utilize the finest raw and manmade ingredients the world has to offer, and that includes carnauba wax and another type of ultra-rare wax, known as montan wax. Satisfying the fixation and exceeding the expectations set forth by one individual to create the perfect car wax for black cars meant going to opposite ends of the world. BLACKFIRE BlackIce Hybrid Montan Sealant Wax is one of few waxes in the world that utilizes a high content of montan wax – a rare and costly wax sourced from Germany. Montan wax, when processed and refined, is known for its darkening characteristics on black and other dark colors. 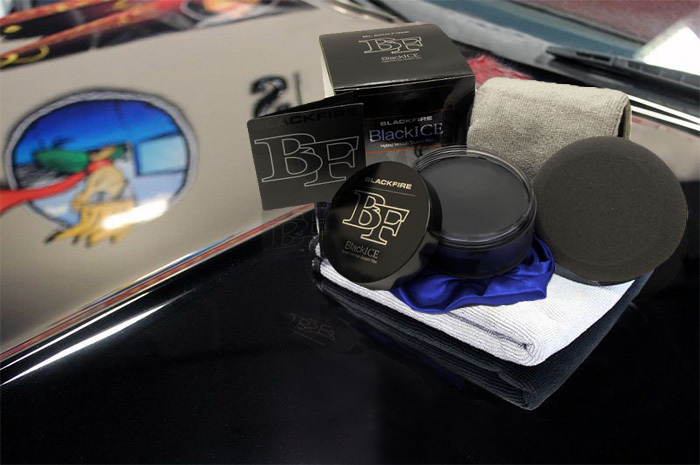 BLACKFIRE’s chemists pioneered a color-charging process to further enhance the paint-darkening effect of the montan wax formulated in BlackICE, creating what can only be described as mile-deep reflections on black and dark colored cars. To ensure BLACKFIRE BlackICE Hybrid Montan Sealant Wax was more than just another show-car wax that had durability measured in weeks instead of months, BLACKFIRE’s signature Wet Diamond Polymers were fused with the carnauba and montan wax formulation, reinforcing the already impressive protection provided by the duo. BLACKFIRE BlackICE Hybrid Montan Sealant Wax imparts a level of gloss worthy of a show-car and a level of paint-protection required for a daily driver. BLACKFIRE BlackICE Hybrid Montan Sealant Wax will provide up to 5 months of paint protection on vehicles that have been properly clayed and polished first. BLACKFIRE BlackICE Hybrid Montan Sealant Wax is crafted by hand to meet the most stringent quality standards. Each jar is visually inspected and random testing is performed to ensure no impurities in the carnauba and montan wax made it through the refining and blending process. BlackICE is packaged in a classy box with the BLACKFIRE logo prominently displayed on the top. Apply BlackICE thin and it will reward you by buffing off with virtually no effort. If your vehicle has never been clayed or if it has been more than six months, use BLACKFIRE Poly Clay II and Clay Lubricant to remove gloss-hindering above-surface contaminants. Next, remove light imperfections and rid the paint of below-surface contaminants with BLACKFIRE Paint Cleaner. It is imperative that you clay and polish the vehicle for BlackICE to perform to its full potential, creating a liquid shine while providing winter-tough paint protection. BLACKFIRE BlackICE Hybrid Montan Sealant Wax needs to be applied extremely thin and allowed to dry to a haze for about 10 minutes before being removed. 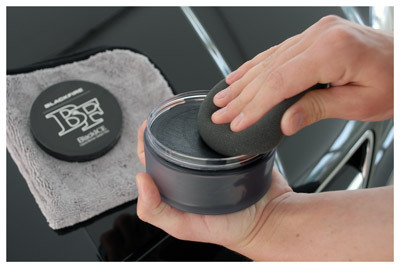 A poly foam hand-applicator works best but you can apply it with a dual-action polisher as well. Use a flat-weave microfiber towel to buff off the wax once it has fully dried to a haze. Avoid applying the wax to plastic or rubber exterior trim. Maintain the shine and protection with BLACKFIRE Instant Detailer. BLACKFIRE BlackICE Hybrid Montan Sealant Wax creates mile-deep reflections on black and dark colored vehicles. Hybrid formula combines the benefits of synthetic and natural ingredients to provide the utmost in paint protection, gloss and clarity. Blackfire Power Pack - FREE With BLACKFIRE Orders over $50!BLACKFIRE Car Dryer - FREE SHIPPING + FREE GIFTLimited Edition BLACKFIRE Ultimate Complete Bucket KitBLACKFIRE Detailer's BagBLACKFIRE Car Care KitsWet-Ice Over Fire – A Different Kind of ShineBLACKFIRE Garage Banner, 14 x 55 inchesBLACKFIRE Synthetic Clay Mitt Cleaner - Coming Soon!BLACKFIRE Pro Ceramic Coating Wash 32 oz.BLACKFIRE Complete Coating Maintenance KitBLACKFIRE Compound 8 oz.BLACKFIRE Polish 8 oz.BLACKFIRE Paint Sealant 32 oz.BLACKFIRE BlackICE Hybrid Montan Sealant Wax 3 oz.BLACKFIRE Car Wash 32 oz.BLACKFIRE Wash & Wax 32 oz.BLACKFIRE Foam Soap 32 oz.BLACKFIRE Foam Booster 16 oz.BLACKFIRE Midnight Sun Ivory Carnauba Paste Wax 7.4 oz.BLACKFIRE Midnight Sun Ivory Carnauba Paste Wax 3 oz. As far as gloss and shine go on a black car, it's average. Easy to apply and if not applied properly, can be difficult to remove. ConsCaution....Do not apply a thick coating. You will have a difficult time removing the wax with a chalky residue. Also, while removing the wax, you will end up with thick spots that will be difficult to remove. You might have to use a Detail Spray to remove it. Even with a light coating, you will end up having a filmy wax coating.....(it's like it never cures to a hard coating). My black 911s looks like a mirror. Great shine and easy application. ConsExpensive. Makes my white cotton gloves as black as my paint and foam application pads are harder to clean. I have found this wax to have an incredible shine on my black Audi. I am also impressed with the durability. I normally wax my cars monthly but this wax will hold up decently for a couple of months. The only complain I have is that it hazes on the hood of my Audi. It does not make a difference as to how thin or thick we put it on, we always have that haze on the hood. I do live in a very humid area that might be part of the issue. I do recommend this though. I just applied BlackIce on my buddies Black 2007 Shelby and I am extremely impressed!! If you have a black colored car or dark colored car look no further than BlackIce. Incredible. I used a Flex 3401 with a 5.5" Lake Country Gold Jeweling pad to apply the wax. Goes on real easy and you can apply thin coats. The only problem is that the wax comes apart real easy and your pads will be black. IMO I will not use those pads on anything else except for BlackICE. The Depth is incredible. That is what I was looking for. ProsVery easy to apply and the depth is incredible. Great for Black or dark colored cars. ConsYour pad will be black and the wax itself comes apart real easy.